Kohanaiki is a gated, oceanfront community on the world-renowned Kona Coast and it’s the most recent luxury residential development to be constructed here. With an attractive new gated entrance with light signals for easy access from and into the community, newly emerging neighborhoods and recently completed world-class amenities, demand is strong for real estate opportunities. One of the things my clients love most about this casually elegant property is the variety of options available from estate sites to single-family custom homes and villas. 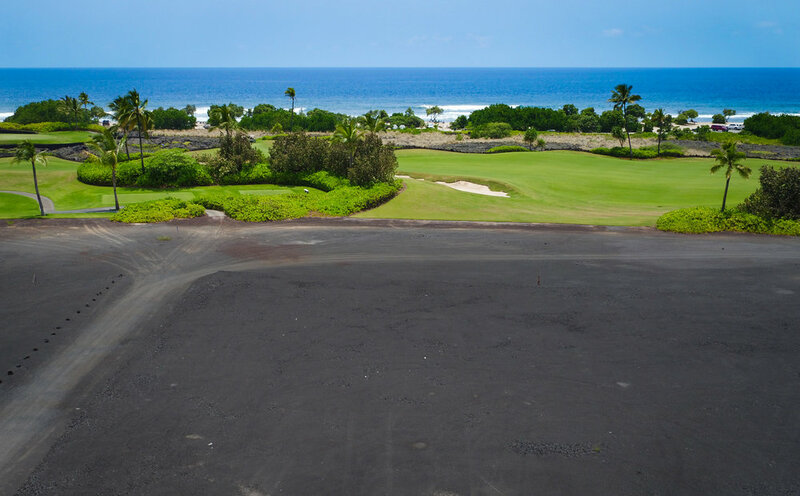 Another huge draw is the opportunity for property owners to join the Kohanaiki Club and enjoy the many benefits of membership. Among them, unlimited golf on the Rees Jones-designed championship course, a state-of-the-art fitness center, numerous swimming pools, and the incomparable 67,000 sq. ft. Kohanaiki Clubhouse and Spa created by noted San Francisco architect Shay Zak. This comfortable, expansive space also houses the club’s signature restaurant under the direction of Executive Chef Patrick Heymann, a 21-seat movie theatre, a four-lane bowling alley, and an adults-only cigar and card room. The Beach Club offers casual dining and numerous activities for ocean sports lovers. Currently, I’m pleased to have five attractive properties listed and available for purchase at the resort. Hale Maia 11 is located near all the world-class amenities available at the Club House and enjoys panoramic ocean, mountain, and Rees Jones Golf Course views from the second floor. Quality-built with custom details throughout, the home was constructed by Maryl, one of Hawaii’s premier contractors. Interiors were created by the Henderson Design Group in collaboration with the team at Restoration Hardware. Contemporary, sophisticated lines are found throughout the interior spaces with hardwood flooring featured in all living areas while tile flooring is used in the kitchen, bathrooms, and lanais. Added bonus: the home includes a detached one-bedroom ohana(guest house). All bedrooms enjoy en-suite baths, and the kitchen is a dream for at-home chefs with its large kitchen island, top-of-the-line appliances, wine cooler, and granite countertops. The property is offered furnished with just a few art exclusions. The owner is offering a $150,000 credit to the buyer upon closing. Zak Hale 9 showcases classic Hawaiian-style architecture in a spacious, open floor plan design. The carefully curated finishes include granite counter tops, mahogany wood, stone flooring, and a hi-tech AV system. Stainless steel Wolf appliances are found in the attractive kitchen. The gracious home, with interiors by Sequoia Contract Works, overlooks the 9th fairway, providing incredible views of the golf course and ocean. With sustainability in mind, a net-metered photovoltaic solar array provides the power. The large infinity edge pool, spa, built-in grill, and tiki torches provide everything needed for the ultimate in comfortable outdoor living. Offered furnished with a few exceptions. Located on the end of a tropically landscaped cul de sac, this home enjoys both ocean and coastline views from the great room, covered lanai, kitchen, and master bedroom. Designed by architectural firm Glazier Le, interior furnishings are the work of San Francisco designer Nicole Hollis. Hale Alani’s southwest vantage point provides a perfect view of the adjacent natural preserve, majestic mountains and the 7th and 8th hole fairways on the Rees Jones-designed Golf Course. Its private courtyard houses a detached one-bedroom guest house, ensuring privacy for all. Features include a walk-in wine room, energy efficient solar panels, Atlantic black granite stone flooring throughout and Cambria Devon quartz countertops. The home is offered furnished. This newly constructed, never-lived-in, spacious, beautiful home sits on 1.23 acres of pristine land and includes a detached guest hale (house). Designed by one of the island’s most contemporary architects – native Big Islander Kari Kimura – the residence is the epitome of classic Hawaiian-style that encourages indoor-outdoor living. Interior spaces feature vaulted ceilings, custom kitchen and extraordinary finishes throughout. Bordering one of the island’s national parks, this exceptionally private home is located at the end of a quiet cul de sac and, yet, is within close proximity to all amenities. An expansive backyard with a lap swimming pool is the perfect spot for entertaining friends and enjoying the year-round perfect climate. Located within The Shores at Kohanaiki Resort neighborhood, this expansive building site is waiting for your perfect home in paradise! Situated on the 14th hole of the Rees Jones Golf Course, the lot has roughly 220 feet of emerald green golf course frontage. It enjoys panoramic ocean views and is near one of Hawaii Island’s top year-round surf spots (Pine Trees) as well as a popular snorkeling and scuba diving reef. Plans by San Francisco-based Zak Architecture are available with purchase of the property. For more information about these properties or additional Hawaii Island real estate opportunities, please contact Carrie Nicholson, R (B), BIC, Director of HL1-Big Island, (808) 896-9749 or carrie@HL1.com. Drink Pink at Fairmont Orchid throughout the Month of October!